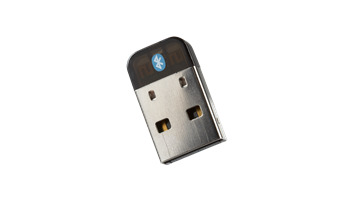 The miniature Bluetooth dongle is the world’s smallest Bluetooth dongle designed to upgrade a PC to Bluetooth-enabled system, capable of connecting up to 7 Bluetooth devices and transmitting data wirelessly up to 33 feet. Designed with the latest Bluetooth v3.0 technology, the dongle offers EDR (Enhanced Data Rate) technology that improves data transmission speed, enhances transmission security, and saves energy. In addition, EDR also allows up to 7 Bluetooth devices to operate simultaneously. The miniature dongle design provides plug-in and leave-in convenience for great usability. Featuring a High-Speed USB physical connector, the dongle offers up to 40-times the transmission speed than the original USB. The VP6493 Nano Bluetooth Class 2 v3.0+EDR Dongle is the ultimate upgrade your PC deserves. Overall Dimensions: .6" x .2" x .8"